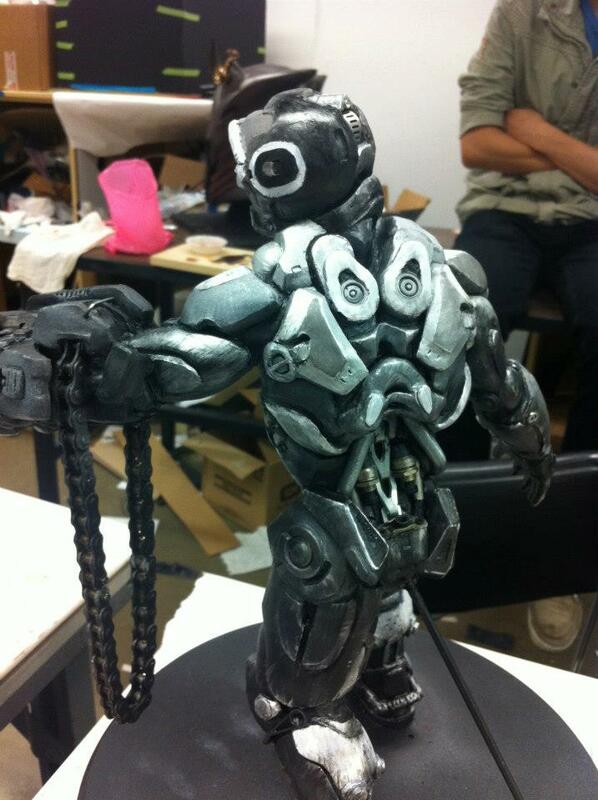 Art of Jason Kang: RoboCop Maquette! Haven't been able to take any pictures of my own so I'm borrowing these from other people who went around taking pictures. 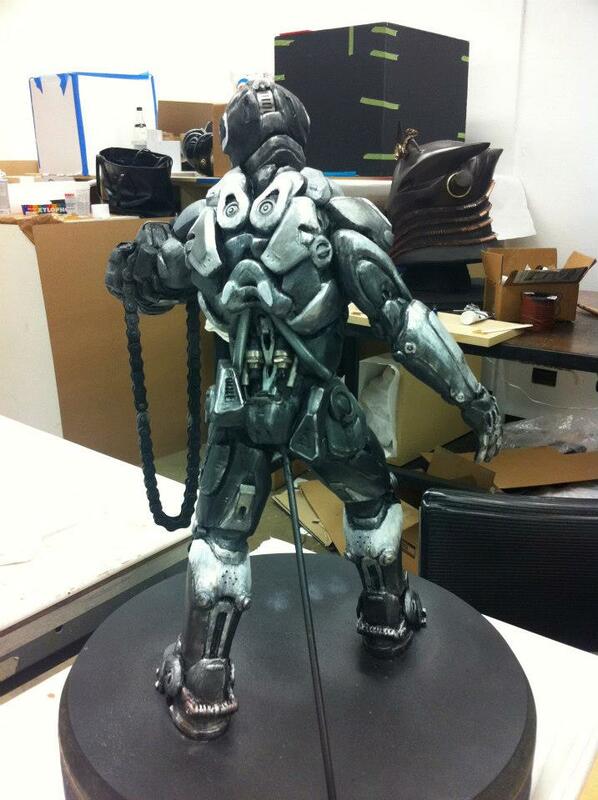 Anyways, this is my completed sculpture of my RoboCop redesign! 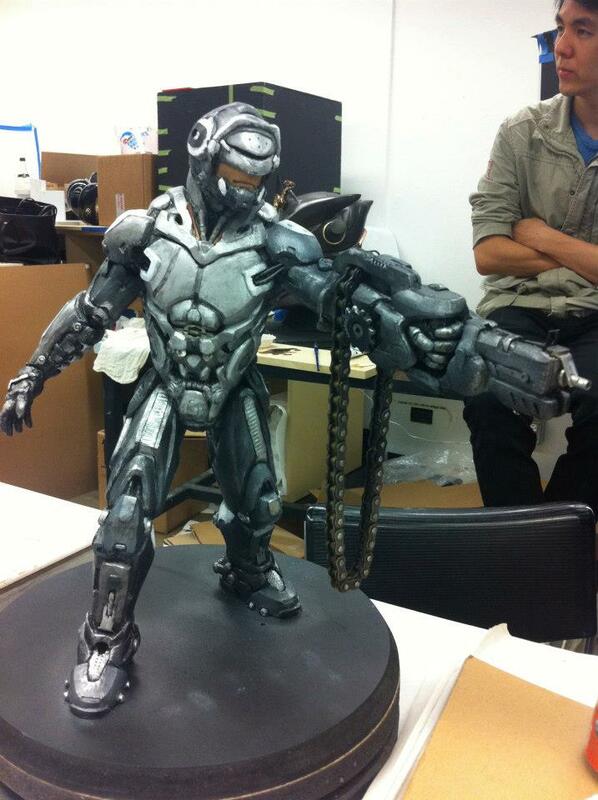 My concept was to create a RoboCop built to be able to take a bullet, plus some. Detroit has become a criminal empire, and it has become impossible for regular cops, or even the United States government, to tackle the firepower, and manpower, these not-so-everyday crooks possess. So RoboCop, built more like a tank than a cop, was created and sent in to clean up the city. I wanted him to look like he was put together with slabs of metal and that when he walked, all these pieces of concrete-like plating would move and twitch around so that his body looked more organic and actually a part of his physiology. It was important to ensure he did not just look like a guy in a suit of armor. For the gun, I originally intended to go with something more subtle, but I realized that a character of his bulk and strength would need something to match. My roommate is an airforce vet and he told me that the guns mounted in the helicopters he worked on were so strong that if the bullets were to pass by you, and not even hit you, you would still ripped to shreds. I wanted this kind of power in the hands of a badass like RoboCop. The power to level buildings just by aiming his fist at it. I wish I had spent more time on it. There was a period during our 14 week term where I didn't touch this for two weeks, and I think this sort of negligence really killed me in the end. Impossible to make up two weeks of lost time in a few short days it seems haha.. I'm still happy with the results though, glad it didn't turn out like my initial design and became something a bit more grungy?